Girl washing window with detergent. Busy young woman indoor. Female hand washing window. Woman cleaning glass with detergent. Eco friendly home cleaning products. Woman washing window with detergent. Busy young female indoors. Young housemaid washing window. Woman with rag and bottle. 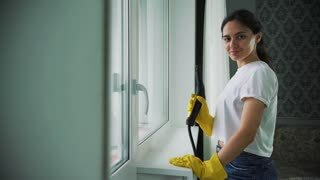 Woman is washing window. Girl wiping glass with rag. Woman washing window. Busy lady indoors. Lady washing window. Woman with rag and detergent.